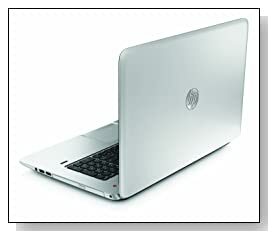 HP Envy 17-j020US is a capable 17 inch notebook that is able to handle any applications other than latest games without any problems. It has a powerful processor, a big 17 inch screen that is perfect for movies and games, a large 1TB hard drive, plenty of memory for multitasking as well as great video and audio quality. Intel Core i7-4700MQ at 2.4GHz (6 MB Cache) for much better performance, 8 GB DDR SDRAM to run multiple apps at once, 1024 GB at 5400 rpm Serial ATA-150 hard drive for being able to save more files..
Great entertainment and image quality on the large 17.3-Inch bright HD screen at 1600x900 pixel resolution with Intel HD graphics 4600 graphics card (1792 MB) that is 30% faster than Intel HD 4000 graphics as well as very advanced sound quality with Beats Audio and four speakers, advanced noise reduction software and two microphones..
Silver HP Envy 17-j020US is 1.21 inch thick and weighs 6.3lbs. It has a full-size ergonomic and comfortable keyboard (although not backlit) with 10-key numeric keypad for easy data entry and SuperMulti DVD burner, Intel Smart Connect Technology support, 4 x USB 3.0 ports for 10 times quicker data transfers than USB 2.0's and 802.11b/g/n wireless, Bluetooth 4.0 and Intel Wireless Display (to connect wirelessly to supported large screen displays) for wireless freedom. It comes with Windows 8 with its customizable tiles pre-installed, which is not as hard to use as many people think. And the system and keyboard don't get very hot when you are working on it even for hours, thanks to HP CoolSense. 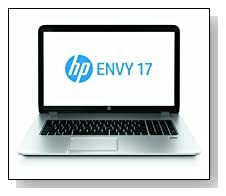 Verdict: HP Envy 17-j020US is a great system overall that will help you with any of your daily tasks and will be good at anything other than the latest 3D games as that would require a bigger graphics card. If you'd like something with an i7 processor, 8GB RAM memory, 1TB hard drive, big 17 inch screen and great audio quality, it may well be the one for you. Now offered with a great discount on Amazon..